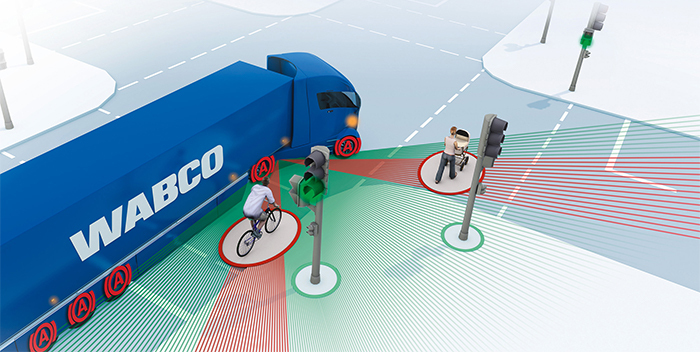 WABCO Holdings Inc. unveiled a new version of the OnGuardActive collision mitigation system. OnGuardActive is a radar-based active safety system that provides forward collision warning, active braking and adaptive cruise control to assist drivers in recognizing and responding to situations that could lead to a rear-end collision. The newest version of OnGuardActive allows for a full stop from up to 37 MPH through active braking after detecting stopped, stationary and moving objects. The OnGuardActive system offers improved object detection via enhanced filtering capabilities of the integrated far- and near-range dual-beam radar. The system detects objects up to 650 ft. ahead, allowing the driver to take evasive action, if necessary. OnGuardActive helps reduce rear-end collisions by up to 87%, the company said. You can read more details about WABCO’s technology in our safety system roundup here.